650/700 x 17 Michelin D.R. 400/450 x 19 Michelin D.R. Replacing beaded edge tyres, cross-ply tyres with bead wires formed the second generation of detachable tyres. These tyres benefited from two major innovations: the introduction of carbon black and the appearance of textile wire cords in the tyre carcass. The incorporation of wires into the bead in 1925 led to an improvement in tyre retention on the rim. These tyres also benefited from two major innovations prior to their creation: - the introduction of carbon black in 1917 which led to a five-fold increase in tyre service life - the appearance of layers of textile wire cords parallel with each other in the tyre's carcass, which gave rise to the so-called "cable" tyre in 1919 and the "cable confort" in 1923, the first low pressure car tyre (2.5 bars 36 psi). "Double rivet" or D.R. is in fact the name of a tread pattern which first saw the light of day with the first generation of tyres for motor cars, beaded edge tyres. This tread pattern was retained for first tyres with bead wires in 1925. This tread pattern, with its old-fashioned appearance, was truly revolutionary at the time. 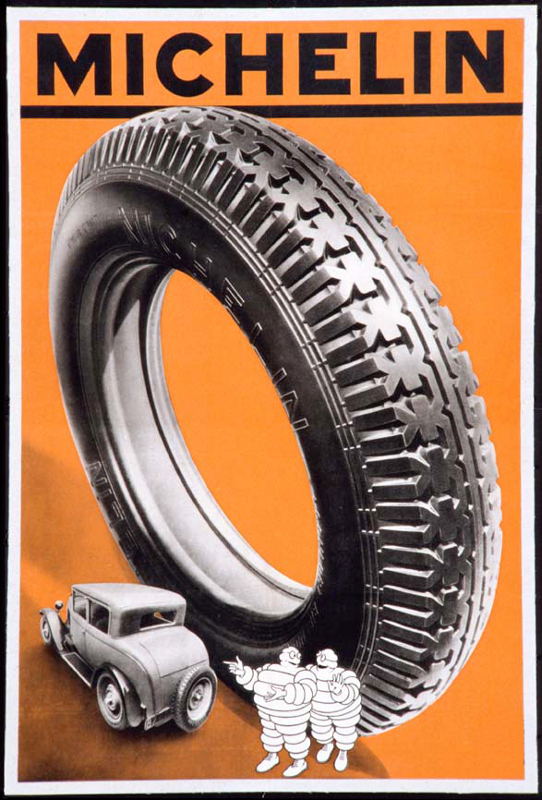 It was also the inspiration for the first radial tyres.